If you look at various generations of the C-Class, you'll notice that each one of them was instrumental in setting a precedent for a new design philosophy for the other Mercedes-Benz cars of that generation. Despite that, every C-Class has had a significantly distinctive styling that looked like no other offering from the rest of the Mercedes-Benz line-up. But things have changed. 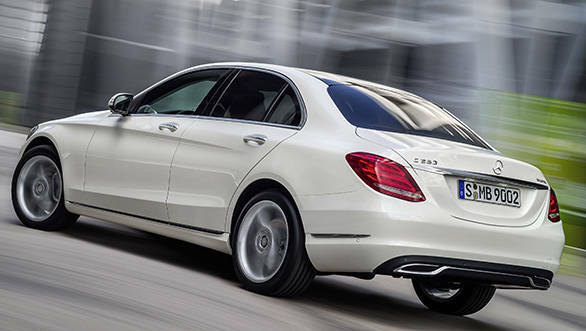 What looks like a baby S-Class in this review, is actually the new C-Class. Having a design that is similar to the grand daddy of luxury cars is a good thing. There are, however, a couple of problems. The tail lights look great but the tailgate doesn't appear as grand as the posterior of the S-Class. In fact it ends up looking like a 'Me too!' job. The face, especially on the 'Exclusive' trim that features the large chrome-plated three-slat aero-grille, looks too grown up for a sports sedan. That said, the car still has the classic C-Class silhouette - long nose, pulled-back cabin and a stubby boot. 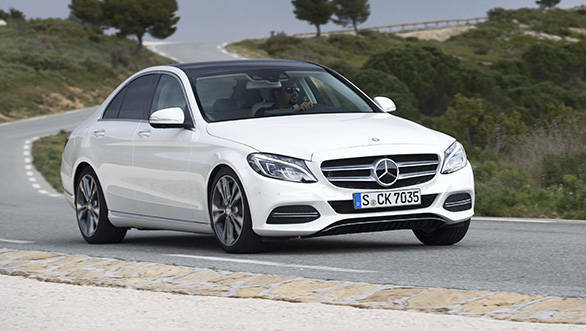 Out of the three trims that the C-Class will be sold in, we expect the Avantgarde and AMG lines to come to India. Both of them feature a two-slat grille with the centrally mounted three-pointed star, but the AMG line gets a sportier bumper with distinctively larger air dams. We won't be surprised though if a watered down Executive trim is offered too in order to replace the Elegance trim seen on the current model. Save for the sportier bits in the AMG line, the C-Class doesn't appear as aggressive as before. But that is perhaps justified because the C-Class is no longer the entry-level sedan from Merc. They now have the CLA as the more youthful car to do the job of attracting first-time buyers to the luxury brand. Therefore the new C-Class is designed to look more mature, elegant and sober and this will still continue to work in its favour. Just when you thought that equipment like the cross-spoke air-con vents, the three-spoke steering wheel with square-patterned switches and a dated centre console with a cluttered switchgear were becoming a common sight across the new Mercedes-Benz cars, the C-Class pleasantly surprises you by maintaining its S-Class inspiration, even for the interiors. What you get is a long, flowing centre console with minimal switchgear that controls the HVAC and basic audio functions. It bisects the front seats and is set really high, so you sit securely cocooned by it. The COMAND infotainment uses the latest software seen in the S-Class and continues to use a stick-out screen, but its size varies as per the grade of the trim. It still isn't a touchscreen system, but gets a touch panel on the centre console. It can be used for controlling the infotainment using multi-touch gestures and for scribbling words and numbers for the sat-nav and telephony. The classic rotary dial for navigating through the system is still present and also happens to be the faster way to get around. The design of the interiors refreshingly blends the sporty with the elegant. 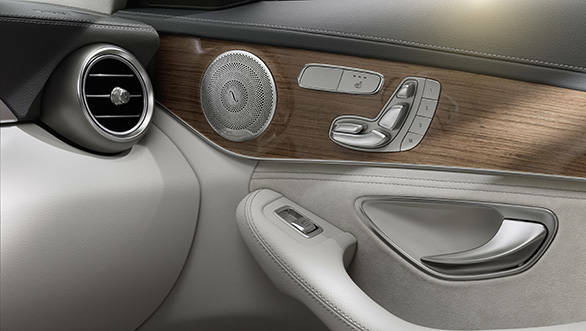 The round air-con vents and the textured metal switches feel exactly like those of the S-Class and operate with a reassuring 'click'. This lends a premium character and adds to the feel-good factor that the wood and leather trim presents you with. 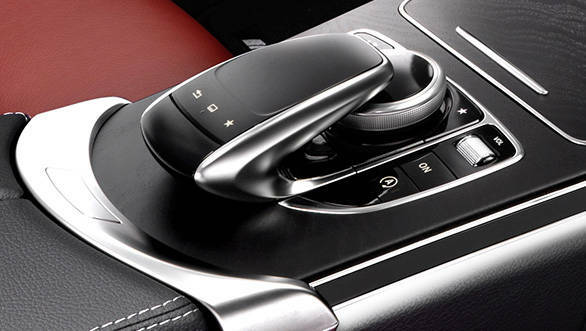 The steering wheel is an evolved version of the familiar three-spoke design and gets a new layout for its switches. This one is not like the one in the S-Class, for that would be asking too much of it. There are tons of new features as well, like the radar-guided lane change prevention, automatic brakes, automatic parking etc. But since our stringent norms prevent most of these radar-based systems from coming to India, we'll speak about them closer to the launch. There are new airbags too, that is pelvis bags for the front seats, a new window bag, side bags for the rear seats and one for the driver's knee. Also, the C-Class finally gets a heads-up display for odo, sat-nav and vehicle info. Since BMW has touted this feature for the 3 Series, we expect Mercedes-Benz to bring it to India too. 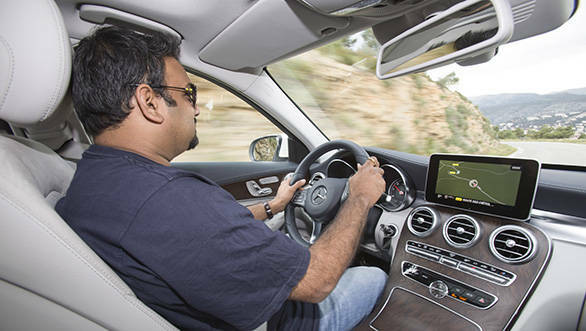 The C-Class has grown in length, width and footprint and that reflects in the cabin as well. Good news for the chauffeur-driven is that the rear seat is significantly roomier than the outgoing model. Despite the coupé-ish roofline, the headroom is good. The front seats have all the electric adjustments common to this segment, including memory functions. Despite the high-rise centre console, quickly finding an ergonomic driving position isn't a problem. Once at it, you will realise how the C-Class has been transformed into an all-new car. While the engines are essentially the same as the outgoing model, everything else around it has undergone a sea change. To begin with, the aluminium-steel hybrid chassis is 70kg lighter. 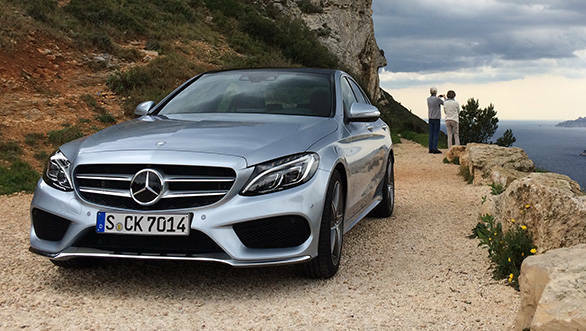 The weight loss isn't evident when you are driving the car, but it has contributed to making the 2015 C-Class more fuel-efficient. The refinement levels of the engine and the overall noise insulation for the cabin has been improved further too. We sampled the petrol and diesel options likely for India. The petrol being the C250, which uses a 2.0-litre unit producing 211PS and 350Nm; and the diesels being the C220 / C250 BlueTEC which use a 2.2-litre oil burner and churn out 170PS/400Nm and 204PS/500Nm respectively. The petrol engine is a smooth operator and feels quite eager despite the power figures suggesting otherwise. The C250 BlueTEC too is surprisingly rev-happy for a diesel. It makes good use of the power and torque to manage a 0-100 kmph sprint of 6.6s, which is the same for the C250 petrol. But the C220 BlueTEC is what I was most interested in since this is the one that will get the cash registers ringing for Mercedes-Benz in India. Though not as eager as the other two, the C220's 400Nm torque is nicely spread across the rev-range for effortless city and highway driving. It is also the most fuel efficient with a claimed figure of 25kmpl compared to the C250 and C250 BlueTEC's 18.8kmpl and 23.2kmpl respectively. The surprise however, is the new electro-hydraulic suspension setup. Called Airmatic in Mercedes-Benz speak, the suspension is adaptable and offers various modes to choose from under the 'Agility Select' moniker. Since Mercedes-Benz is aware that its clientele inclines towards better comfort than sporty performance unlike BMW buyers, the C-Class is still tuned for better ride quality. Therefore in 'Comfort' mode, the suspension is cushy on undulated roads but tends to squat around bends. Toggling the agility-switch into 'Sports' mode though stiffens things up significantly and makes for surprisingly sporty handling dynamics. 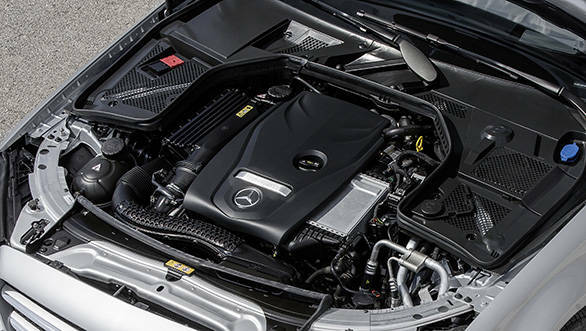 The electro-mechanical steering system also gains weight instantly and feels as precise as the one in the CLS. It also alters the throttle response and shift points for the seven-speed dual clutch transmission. All these components come together to make the new C-Class a good balance for both the comfort seeking chauffer-driven and the thrill seeking self-driven. With this W205, Mercedes-Benz has literally transformed the C-Class into something else. It is more luxurious than before, has a completely new design direction and commands features, tech and performance that will send the competition back to the design board. But it also means that all this will come at a price. Add to it the fact that this C-Class in India will also have to make room on the price chart for the CLA. So in a nutshell, the new C-Class could end up being pricier than its outgoing counterpart, but from whatever we have seen and driven - it will justify what it demands.